Similar to cross country skiing, this versatile activity promises a full body workout and increased strength. Dr Juliette Fritschi from Urban Poling tells us more about this unique sport. Coined in Canada, Urban Poling is based on the concept of Nordic walking and promises a full body workout that is low impact and cost effective. Originally developed as a summer training program for the Finnish Olympic cross country team, Urban Poling promises serious results. Here’s your need to know on the sport. It’s essentially a form of walking using specialized hand held walking poles. It’s a versatile activity which can be done on sidewalks, roads and trails. 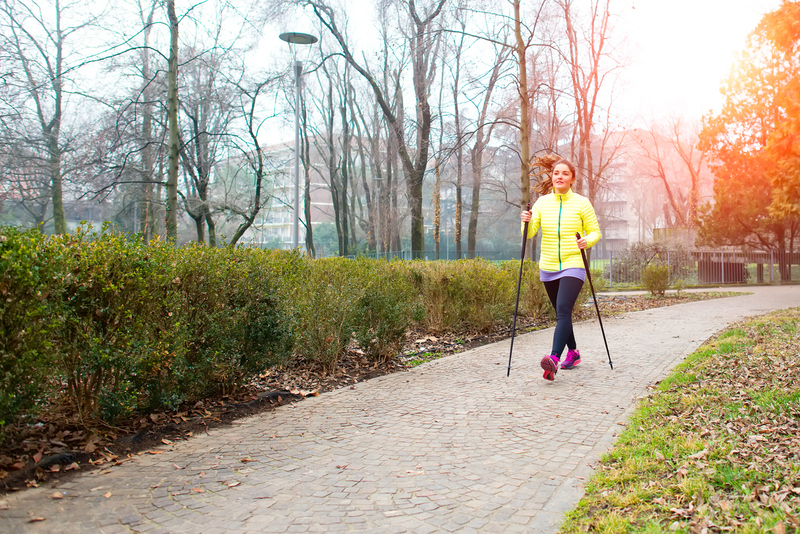 What are the health benefits of urban poling? It's highly effective for core strengthening. For example, if you were to walk with Urban Poles for 10 minutes, applying a downward force on the ledge of the grip every time you swing your arms forward, you would contract your abdominals approximately 1,000 times. Thus, it is a great activity for whittling your waist. At the same time, the specialized walking poles promote an upright posture, reduce impact on your hip and knee joints and provide support to help you balance. Due to the full body workout and strengthening aspect of the activity it is also used for rehabilitation. For example, for improving posture and dysfunction in the shoulder, neck and back caused by prolonged computer use, or for offloading painful hip and knee joints due to arthritis or surgery. How does this compare to something like hiking or power walking? The equipment and technique used when Urban Poling are quite different from hiking. Urban Poling poles have an ergonomic grip with a large flared ledge. This ledge is the key aspect of obtaining benefits. The downward force from the users hand on the ledge activates the core and upper limb, off loads the lower limb, and increases walking speed and energy output. There is a boot shaped rubber tip that supports the poles in a diagonal position to propel you forward, similar to cross country skiing, while absorbing vibrations when poling on hard sidewalks and roads. The Urban Poling technique involves swinging out your hand as if you are giving a friendly handshake and keeping your elbow fairly straight. The ergonomic handle maintains your wrist in a neutral position on the handle ledge, thus minimizing strain. The technique is regular and rhythmical – like marching. When hiking, you generally keep your elbows bent to maintain the poles in an upright position, and use the poles sparingly for difficult terrain and hills. Powerwalking lacks the benefits of the poles for promoting an upright posture, strengthening the core, offloading knees and hips and assisting with balance. Any top tips to improve my technique? Keep your elbows fairly straight which targets more of your core muscles. Keep a loose grip on the handle and focus more on applying a downward force on the ledge of the grip as a tight grip can cause strain on your wrist and hand joints. Don’t use cheap poles which don’t have a ledge for core strengthening as they may slide when pushing down on the poles. Urban Poling classes have started in various locations around Brisbane with Dr Juliette Fritschi, a physiotherapist who completed her PhD at The University of Queensland on the health benefits of walking poles. Juliette also conducts in-services and training courses on Urban Poling to interested health professionals and organisations. For further information, contact juliette@urbanpoling.com Instructional videos on pole selection and technique are available on the Urban Poling website at www.urbanpoling.com under “Getting Started”. To find Urban Poling Poles through local retailers, go to www.urbanpoling.com under “Find a Retailer (Australia)” or buy online at HMR-Healthcare.com.au.